The Genesis G70 has already impressed us as a challenger to the German reign over luxury sedans, with its rear-wheel drive, manual-option layout, and now it’s teasing a higher performance model could be in the works. The folks over at Road & Track spoke to Mike O’Brien, the head of product planning for Hyundai and Genesis, who tantalizingly teased the G70 has a lot of potential for performance going forward. 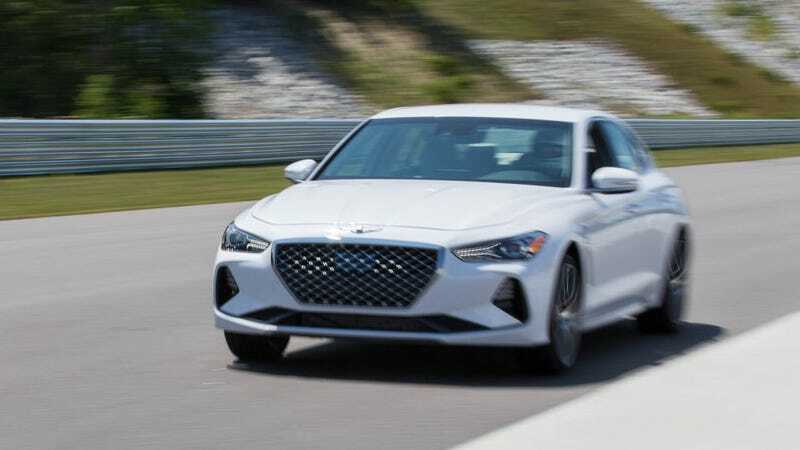 Technically, the highest performance G70 is currently the 3.3-liter twin-turbo V6 rated at 365 horsepower and 376 lb-ft of torque, but the fun one with the 6-speed manual is only available as a 2.0-liter turbo 4-cylinder with 252 HP and 260 lb-ft. It’s obviously not clear what Genesis could have planned for a performance G70. It hasn’t even figured out how it would brand the car. Hyundai has been pushing its new N line of performance cars with the Veloster N, Veloster N TCR and the recently revealed manual Elantra GT N-line. But Genesis isn’t sure if the N-branding would carry over, according to O’Brien. Genesis is also interested in motorsport, with O’Brien mentioning considerations for GT3 and GT4 prototype racing. Having recently driven the manual four-cylinder G70 this week, the car would certainly be a suitable foundation for some performance upgrades. As Road & Track mentioned, if Genesis was bold enough to go for the 3 Series with the G70 in the first place, why not gun for the M3?